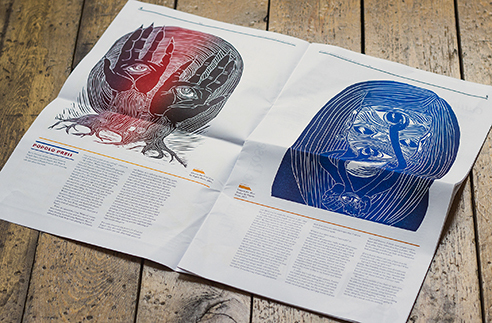 Founded by two printers from Shipley and Whittington, there’s a new handmade magazine, that worships the process of printing in an almost religious manner. It is named after the typography symbols for a second (dagger) or third footnote (double dagger) if an asterisk was used before that. 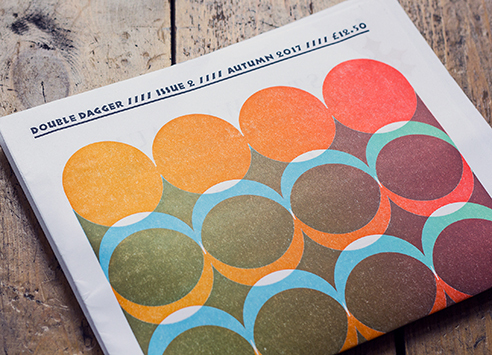 The Double Dagger is a 16pages broadsheet journal printed on an old Heidelberg SBB Cylinder Press from the 1970’s. This press is known as the Rolls Royce of letterpress printing and is famous worldwide for her fast and very accurate printing. The magazine is also entirely printed from hot-metal, wood, and laser-cut types and uses a Monotype Composition Caster from the end of the eighteenth century. Invented by Tolbert Lanston, it made it possible to produce individual hot-metal characters. It was a breakthrough in publishing and printing worldwide, but since the 1980’s it is too costly printing with letterpress. For the Double Dagger team, it is no question why to use these old hot-metal characters. It fits their way of working and represents an integration of the original artists work into the printing process. Not only the printing process is a time-travel but also the design. 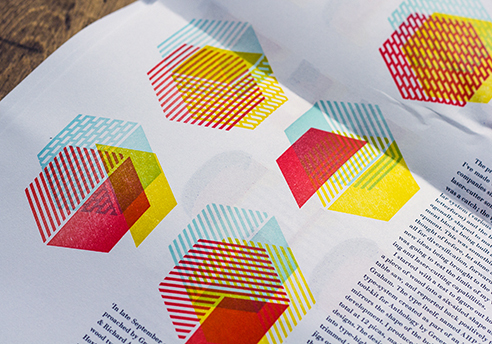 All layouts are designed by hand: cut and pasted up galley proofs, which are taken directly from the monotype machine. One of these galleys has over 100 lines of type and needs three pulls to get ready. One pull for the paste-up, second goes to the contributor for a proofreading and the third one is for the designer’s own proof-reader. Of course, digital elements like screens are used, especially for the laser cuttings, but they should only have an assistant role. Using all these crafting-like materials results in having an inbuilt discipline. The self-imposed grid, for example, limits the use of different structures and so the columns in the magazine have all the same width. For their first issue, they used the typeface Caslon with a 48-point bold italic style and later the team said that this wouldn’t have been their first choice if designed by computer, with all the possibilities of the digital world. But they found these constraints very motivational and inspiring as they had to the best with what they’ve got. So, what do you think about this retro journal? Do you like the idea of going back to a more traditional way of printing? Leave us a comment in the section below!